If you miss a fish, sometimes he comes back but most of the time he does not. Sooner or later, we all burn a fish or three. Chronic fish burners generally look at the fish or simply are not paying attention. Experienced anglers never take their eyes off the fly from the moment it lands on the water to the moment they pick it up again. When a fish breaks the surface of the water on or around your fly, it does not mean that he has taken it. But if the fish has indeed “wrapped his lips” around the fly, then presumably you will not be able to see the fly. So here is the best advice that I can give you: Watch your fly like a hawk and pull when you can’t see it anymore. 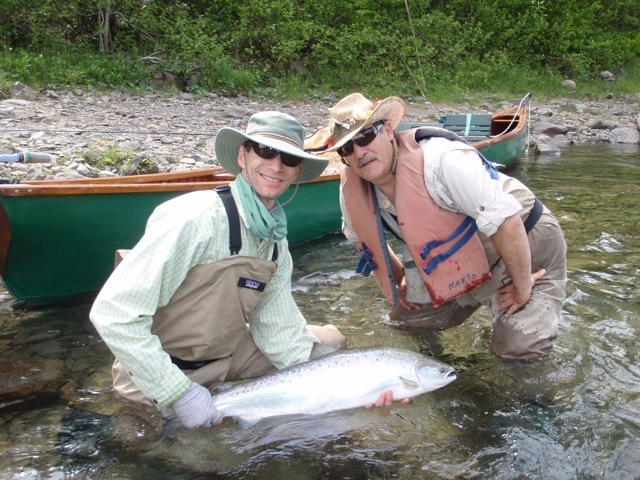 Topher Browne with Camp Bonaventure head guide Mario Poirier release a nice silver salmon. Good dry-fly anglers watch their fly carefully yet remain aware of what is happening beneath it. It is supremely difficult to watch the fish and then turn your rapt attention to the fly when he comes for it. It is far easier to focus on the fly and use your peripheral vision to absorb what is happening beneath it. If there are two of you, have your partner watch the fish while you concentrate on the fly. Just remember to tell him to keep his mouth shut when a salmon comes for your fly!